Enhance your uniform or work out with this long dark orange terry cloth headband. The long headband is a great idea if you have a lot of hair to fit your headband over. The long headband is great if you have a large head, or lot of hair and can not fit a regular sized head band. Our quality terry cloth construction is stretchy and snug, while not being overbearing or uncomfortable. 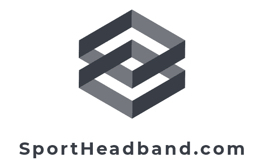 We have solid colors and some stripe versions of long spot headbands to choose from. Looking for a Discount? Check the "Buy in bulk and save" to see the Quantity Discount!!! Best Headband for Large Heads! I've been looking for good quality headbands that are made for large heads. I somehow found your website (thankfully!) and noticed that you had 9" headbands. I ordered 11 of them and they arrived within a short period of time. What a great fit! Now we don't have to wear these tight headbands anymore! Thank you for selling such a great product! I bought these for my husband because he was so tired of the smaller ones (6") springing off his head because they were too tight and too small. My husband has a big head (no pun intended)!!!! So far we are very pleased with this product.